These Brown Butter Pear Bars are loaded with juicy, fresh pears in a brown butter spiced filling, all piled on a crisp shortbread crust. Crispy, crunchy, creamy, sweet, full of brown butter, and loaded with fruit. 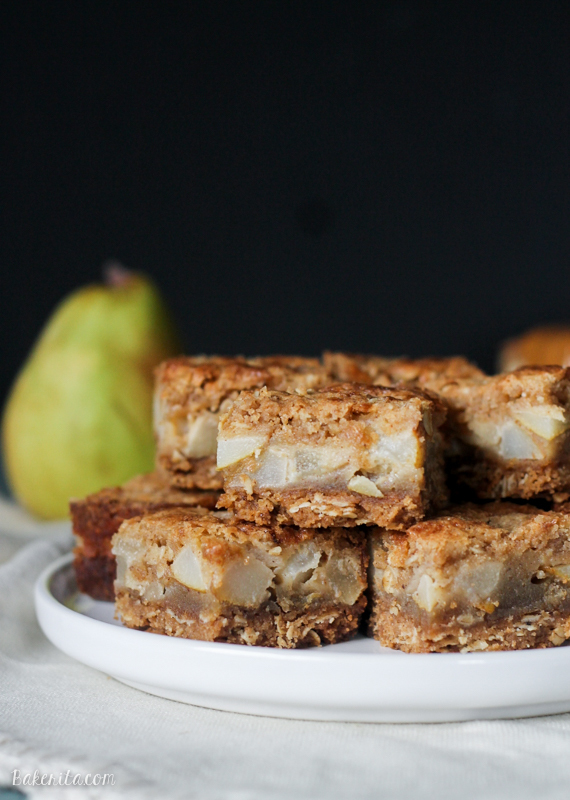 <— that list encompasses a darn whole lot of my favorite words that you can use to describe a baked good, and all 100% accurately describe the amazingness that is these Brown Butter Pear Bars. After getting a big box of pears from Harry & David and devouring most of them plain (soooo good…), I realized the vast insufficiency of pear recipes on Bakerita. 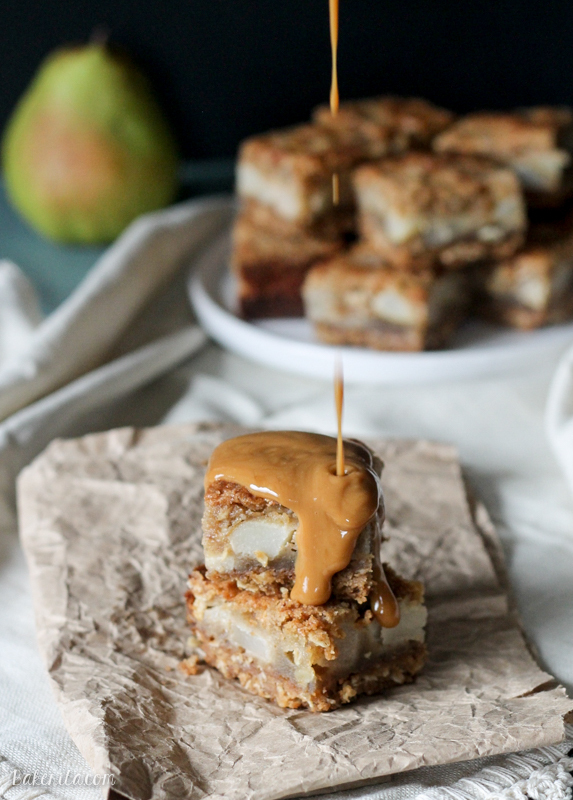 So, fixing to change that, I dreamed up these bars, layered with brown butter, creamy pear chunks, and an irresistible flavor, and they turned out even better than I had imagined they would. Let’s start from the bottom, shall we? Holding these bars together is the shortbread crust. It’s a fairly simple crust recipe, and comes together quickly and easily. Browning butter for the crust is an option if you want to go through the work of browning the butter twice for this recipe, like I did (once for the crust, once for the filling). It’s a bit of a pain, but I think it’s worth it for the ultimate brown butter flavor. But – if you don’t want the hassle, skip it and just use melted butter, and the crust will still be absolutely delicious. No judgement. The crust is buttery, full of brown sugar, and has oats mixed in for some added texture. It’s got that delicious shortbread crumble that I love, but with way better flavor. Before you bake the crust, you’re also going to reserve some of it to double as a crispy topping for the bars. Because obviously crispy toppings make everything better, but I’m not trying to do more work to get there. Now, let’s talk about that pear filling. Here’s where the brown butter is absolutely necessary. The filling is somewhere between being cakey and custard-y, with a soft bite that’s bursting with flavor from the brown butter and spices. The pears bake up soft and creamy, and the mild flavor of the pears is amped up from all the deliciousness surrounding it. The crust holds up to the filling perfectly, and the combination of textures is something to dream about. Sprinkle on that extra crumble topping, and voila – brown butter pear bars, ready to be drenched in caramel sauce if you’re feeling as decadent as me, or to enjoy on their own. 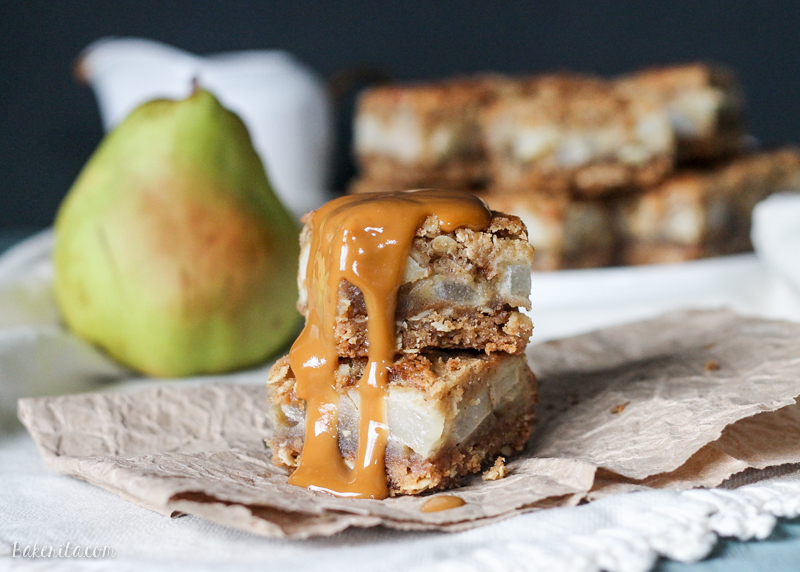 These bars are unique in flavor, but also reminiscent of apple pie in the best way possible. They’re also probably my gateway drug to baking with way more pears. Get ready. Preheat the oven to 375°F. Line an 8x8-inch pan with parchment paper and grease with butter or non-stick cooking spray. Set aside. In a bowl, mix melted butter (or browned, if desired), sugar, and vanilla. Add flour, oats, and salt and stir until incorporated. Reserve 1/2 cup of dough for topping. Transfer remaining dough to the prepared pan, and press the dough evenly across the bottom of the pan. Bake for about 18 minutes or until golden. Transfer crust to rack and let cool while you prepare the filling. Keep oven on. In a small heavy saucepan over medium heat, melt butter until deep nutty brown, stirring often and watching carefully, about four to six minutes. Be careful not to burn! Immediately pour browned butter into glass measuring cup to cool slightly. In a separate bowl, whisk together sugar, eggs, vanilla, and salt. Add flour, cinnamon, and nutmeg and whisk until smooth. Gradually whisk browned butter into sugar-egg mixture; whisk until well blended. Fold in the chopped pears. Carefully pour browned butter mixture onto the cooled crust. Sprinkle with reserved crumble topping. Bake bars until golden, and a tester inserted into center comes out clean, about 35-40 minutes. Cool bars completely in pan on rack. Use the parchment paper to remove cooled bars from pan and cut into squares with a very sharp knife. Store at room temperature in a covered container. These bars are absolutely gorgeous! These bars sound so delicious, Rachel! I wish I had one now. Lovely photo too! Yum, you had me at brown butter! That thing is awesome! Such a great combo! I don’t use pears nearly enough and this looks like the perfect recipe to try! These bars look amazing, Rachel! I definitely need to try baking with brown butter, sounds delicious! And your photos are so gorgeous, too! I can’t think of a more heavenly combination than pears and brown butter! Looks like some seriously delicious bars! Rachel, I keep wishing for spring but these bars make me kind of glad it’s still winter and pear season :) Looks amazing! This brown sugar crust sounds absolutely delicious :) Love, love, love these bars!! This recipe makes me realize I don’t eat nearly enough fruit desserts! 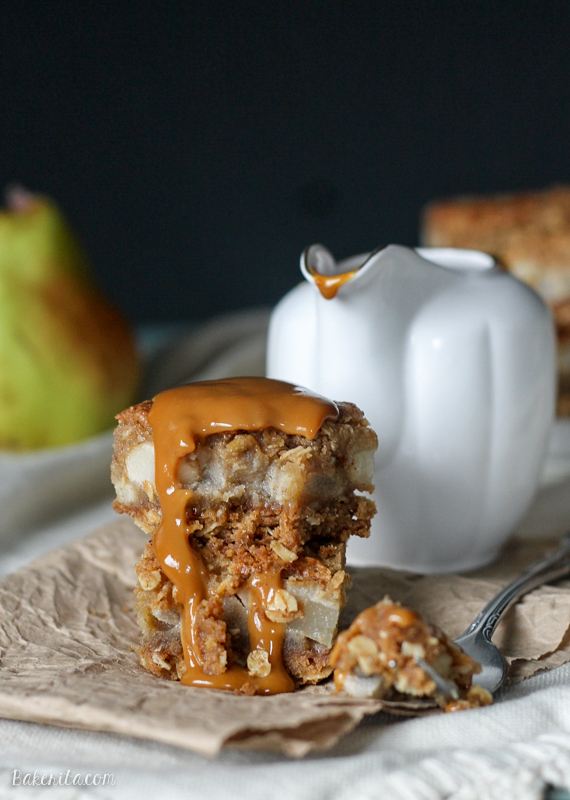 You just made me realize (1) I have almost no pear recipes either and that needs to change, (2) crumble toppings are the best thing that ever happened to fruit, period, and (3) I want to drink that caramel sauce. These look like a work of art — and pure bliss! Pinned! Now these sound amazing! I don’t think you can go wrong with brown butter and pears. What a great combination! OMG complete awesome recipe!! My sweet tooth’s mind has been blown ;-) I love the photos, too!! Wow, this is what dreams are made of, omg, can’t wait to make these! Wow, these seriously sound SO delicious. Pears are one of my favorite fruits, especially one of my favorites to use in desserts. I bet they are SO good with toasty brown butter flavor! And that caramel! Yum! I NEED to start baking more with pears. These look divine, and now you’ve inspired me! Pinned! What?! Yes. I need these. Our Trader Joes had Harry & David pears last time I was there, so I might have to pick up a box just to make something delicious like these bars! Your Trader Joe’s has Harry & David?! Lucky you! Thanks, Sarah. I am totally on a pear kick lately, and they go SO well with brown butter. These are going on my must-try list! I made these with gluten free flour 50% plus 50% oat flour substitutes and had to bake the crust and the squares about 5-10 minutes longer. They came out fabulous–not too wet, which is often the trial of Gluten Free flour substitutes. Just lovely and I will be serving them at the B&B this summer. Sadly, probably not a dough that lends itself to freezing….which creates efficiencies in high B&B season. Truly a treasure! Awesome, I’m so glad that the recipe works well with gluten-free flours! Thanks for sharing Kelley. I hope they’re a hit at your B&B!